For an upgrade in convenience and beauty that will always be in style, consider hardwood flooring. We carry a variety of hardwood floors in stock, and which are also available to order. 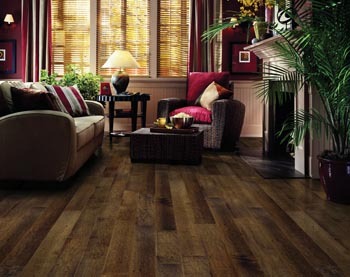 Any room in your house can benefit from wood flooring, and this flooring comes in a variety of styles for any purpose. Strip and plank hardwood flooring are the classic option, expanding the perception of a space while enhancing the existing décor. Hand scraped and wire brushed hardwood floors allow for a more rugged look that is sure to impress. There are two basic kinds of hardwood flooring, solid and engineered wood flooring. Solid flooring is milled into planks from a single piece of hardwood. These planks create the most classic hardwood floors and will last a lifetime with proper care. This option is best for dry spaces, because the wood will naturally expand and contract with changes in humidity. Engineered wood flooring is constructed out of three, four, or five layers of hardwood bonded together. This makes for a highly durable flooring solution that can withstand changes in humidity and harsh climates. Let us help you choose your new hardwood floors. Come into our fully stocked flooring showroom for the ultimate selection in solid and engineered wood flooring. Be sure you’ll get the absolute best price, thanks to our Price Protection Guarantee. If you find a lower price on the same style and brand of hardwood flooring within 30 days of your purchase, we will happily refund the difference in price. Your 100% satisfaction is our priority. Choosing the right floors can add significant value to your home. Not only are they a tangible investment in the durability and appeal of your house, but they also send a clear signal of quality to potential buyers. Installing hardwood flooring is a short and long-term investment. Your new hardwood floors will improve the livability of your home, and then help you sell your house when it’s time to move on. We offer the solid and engineered wood flooring that will impress your guests and the real estate market alike. Hardwood flooring is often one of the greenest options for home flooring. Sustainably harvested natural wood is self-replenishing and low-impact. Managed forestry allows for a reliable source of hardwood without depleting healthy forests. Flooring created without too many chemicals or other irritants is pet-friendly and hypoallergenic. Not only that, but can also be tax breaks for environmentally friendly green select floors! Cork is another sustainable option because this flooring is created from the bark of the cork oak tree. The bark is only stripped from the tree once per decade, causing no lasting damage to the tree itself. This makes cork the ultimate in sustainable flooring options. Contact us today to find the perfect hardwood flooring and give your home the style upgrade it deserves. Financing options available. We proudly serve the communities of Lafayette, Carencro, Youngsville, Broussard, and Scott, LA, plus all of the surrounding areas.